← A Modular Synthesizer Is Coming To My Studio! 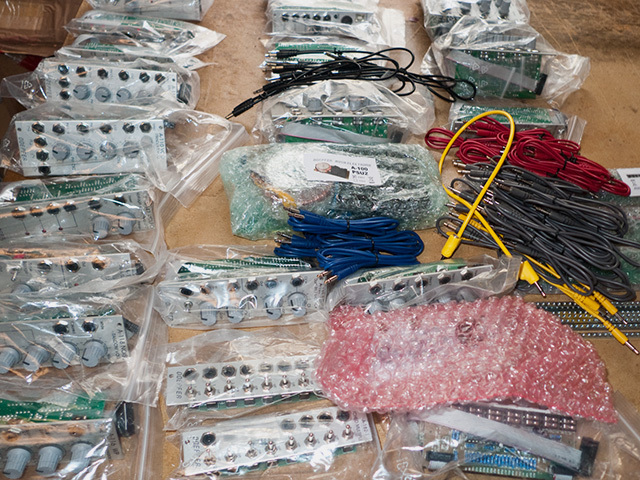 My Modular Synthesizer has arrived. I just took it out of the box. Now, how do I switch it on? Where does my keyboard plug in? Where is the volume control? A Modular Synthesizer is a collection of mainly analogue electronic circuits, which are built into modules. To create music, I interconnect modules using patch leads, and I feed control signals into this network of circuits. This is called a patch. Each module in the patch contributes “something” to the music. Control signal changes translate into changes to the music: texture, pattern, pitch, timbre, tempo, etc. Slow changes often result in complex and evolving soundscapes. Generally, Modular Synthesizers are not for playing melodies, and they often don’t have keyboards. Special monophonic analogue synthesizer keyboards are available for playing tunes. Adapting a MIDI keyboard to work with a Modular Synthesizer, polyphonic lines and chords can be played, but each individual voice requires a complete “sub-synthesizer” to play just this one note. The behavior of complex performance patches is chaotic. Small changes to the values of settings can result in a radical changes to the output… and there is no way to save settings. It is not possible to play a complex patch twice the same way. Modular Synthesizer players live and play for the moment. This entry was posted in Modular Synthesis, Technology Reviews and Do-It-Yourself Tips. Bookmark the permalink.